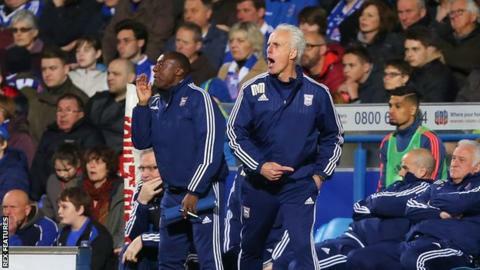 Ipswich Town's 0-0 draw with Charlton dealt a "huge blow" to their play-off hopes, according to boss Mick McCarthy. The result left McCarthy's side seven points from the play-off places, and meant they have taken just two points out of nine from the last three games. "How they're in the bottom three, heaven only knows," 57-year-old McCarthy told BBC Radio Suffolk. "On that showing they're a good team. It just shows there's not a great deal between any of us." Ipswich have failed to score in their last three games, and face trips to top-six sides Sheffield Wednesday, Middlesbrough and Derby in their final six fixtures. "It's dealt us a huge blow of course," McCarthy continued. "We're going to have to keep scrapping and try to get in there. "We'll probably have to go and beat Derby and Sheffield Wednesday and that's not going to be easy. He added: "Charlton were difficult to play against and we weren't good enough to break them down. We both had chances and neither of us took them. "The one thing I didn't want to do was lose it, to be honest, and at the end we could have done because we were going for it."